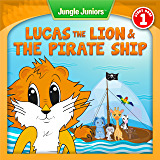 Lucas the Lion and his friend, Ryan the Rabbit, stumble onto a mysterious boat. Ryan wants to take it for a ride, but the apprehensive Lucas refuses. Lucas has never told anyone his secret. Even though he knows how to swim, Lucas is afraid of the water. When Ryan decides to throw a birthday party on the very same boat, Lucas canâ€™t overcome his fear, no matter how hard he tries. Trouble strikes and Lucas is the only one able to save the day. Will he be able to defeat his fear in order to save his friends? The Jungle Juniorsâ„¢ Storybook series is designed to enhance your childâ€™s self-esteem, self-reliance and build positive social interactions. Our mission is to help give your child a head start to make a successful transition from home to classroom. The books can be read in any order. Cut and paste the links below in your web browser. Geoff the Giraffeâ€™s New GlassesÂ â€“ Coming Soon! Jungle Juniorsâ„¢ is an early learning program developed by The Essential Library to help build reading, critical reasoning and socialization skills for young children. Since 2000, The Essential Library has been dedicated to publishing the best in both classic and contemporary novels, poetry and non-fiction. We delight, entertain and inform todayâ€™s readers.